This novel was fascinating. The plot was extremely clever, and this particular work [a Christian Science Fiction novel] constantly engages the reader's mind by discussing amazing scientific and technological possibilities which may be realized in future generations. The story itself is very well written and deserves 5 stars. The reason I am giving the book a 3-star rating is due to the fact that it contains an unusual and excessive amount of bad language. I already knew of this author as a Christian, a musician, a writer of challenging nonfiction, and a man learned in multiple disciplines when I discovered this science fiction novel on a trip to the States. As a reader and writer of fiction myself, I was intrigued. The genre - sci-fi - set this book apart, as did the author's stature. Frankly, very few of the Christian authors I know of are mature men with wide-ranging interests beyond fiction. So how does the book stack up? Well, I haven't read a lot of sci-fi but I know something about the difference between window-dressing technobabble, and actual scientific speculation. I don't understand either of them, but I can appreciate the good stuff. 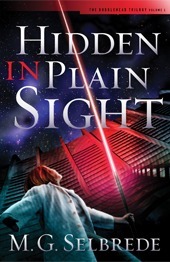 Hidden in Plain Sight is based on real world physics. And it made me curious to investigate where in the book reality leaves off and speculation begins - surely one of the most important functions of the sci-fi genre. In many other respects the book was well-written, with adequate characterisation, reasonable plotting, and a refreshingly original set of themes reflecting the author's presuppositional approach to Christian apologetics. I particularly enjoyed his redefinition of "the supernatural" as "the infranatural" - the constant insistence that the hand of God doesn't reveal itself primarily through miracles but through the universe continuing to operate as usual. This is SUCH a profound point in many ways. Plus, for a book written by a serious gentleman with a beard, there was a surprising amount of humor. And references to classic sci-fi, like A Wrinkle in Time and Ringworld! I do have two complaints. Some readers may be uncomfortable with the non-Christian characters' mildly salty language; while I appreciate the reasoning behind this kind of author's choice, I thought the use was persistent enough throughout the book to constitute a real drawback. The big complaint I have, however, is that while just about every other aspect of the book is good, the writing style isn't. It's not as bad as some books I've read, it could probably be fixed by a good stiff edit, but it's noticeably weak compared to the rest of the book. Hidden in Plain Sight is the work of a very clever thinker and scholar who, unfortunately, has not included the practice of narrative writing - a fiendishly difficult thing to get right, I know - among his studies. That said, this novel was rewarding enough that I sincerely hope one day to see the two remaining books of this projected trilogy published. I have read this book three times since I first purchased it in 2010. Considering how easy it is for me to get sidetrack or lose attention in things, this is one of the few books in my vast collection that completely held my attention from the first word until the last. There is no need to write a long review. Any attempt to try to explain the story line of this book would rob the reader from such a joyous experience; therefore, I will simply say......BUY THIS BOOK NOW!!!! Very... interesting. I'd love to know what a physicist would think of the very imaginative and imaginary physics in this book. While at certain places the book lacks polish, on the whole it is a refreshing change from run of the mill "Christian" literature.